Hibernia Bank dome graffiti-free again! 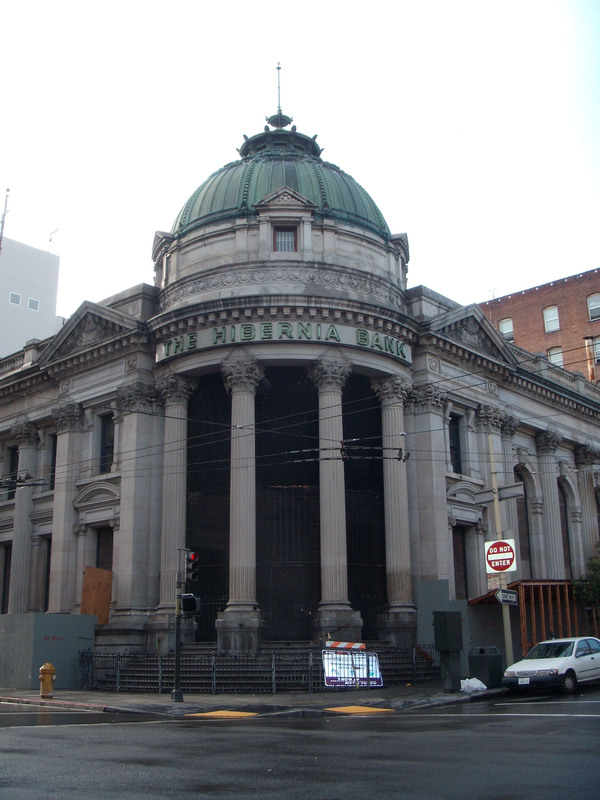 The owners of the once-stately Hibernia Bank building in the heart of the Tenderloin were dismayed to see the granite base of the dome defaced with a massive graffiti tag just a few months ago. See a photo of the big tag here. But the new owners, who, like the bank’s original founders, hale from the old sod of Ireland, moved quickly to get rid of the defacement. A police officer in the SFPD’s Graffiti Abatement Program said acting fast is key to prevent subsequent tagging. Here is the cleaned up bank now, still boarded up while some construction and clearing is slowly being done. The oxidized copper dome still dominates the corner, the gore where Jones, McAllister and Market streets meet. The bank, designed by Albert Pissis and completed in 1892, is one of the most architecturally important buildings in our fair city. It was one of the earliest designs to bring the order of the Beaux-Arts style to an architecturally confused San Francisco. Its debut was also a year before the well-planned buildings of the World’s Columbian Exposition in Chicago in 1893 stunned American visitors with their neoclassic beauty. While the “White City” at the Chicago World’s Fair took the country by storm, it also — as architect Louis Sullivan accurately predicted — set the modern movement in architecture back a few decades. 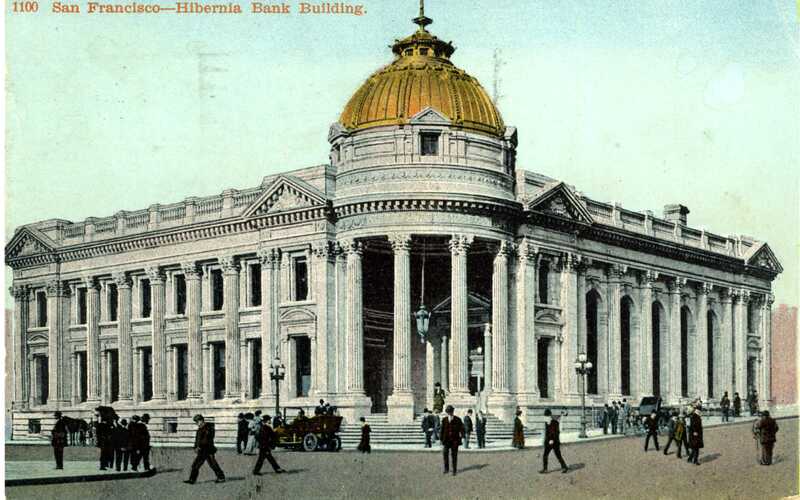 The Hibernia Bank, though, was so well-regarded in San Francisco that even the often cantankerous architect Willis Polk described it as “the most artistic building in San Francisco,” in an article for a society and literary journal, The Wave in October, 1892. Here’s a hand-tinted postcard of the bank, mailed in 1912. Polk and Pissis might be rolling in their graves if they could see the Hibernia Bank today. The once-elegant bank, built for the then-growing Irish savings bank, has been sitting shuttered for years. Its new owners, while they aren’t saying much about their plans, have a real appreciation for the building’s craftsmanship. The interior is said to be in pretty decent condition. But the project, in the current economy, is clearly going to take awhile. The owners, Dolmen Property Group, snatched the building up in October 2008 for a bargain sum of about $3.9 million,according to the San Francisco Business Times. Seamus Naughten, managing director of Dolmen Property Group, said the firm spent $20,000 to get rid of the horrendous tag, and the roof is now equipped with an alarm system. Beneath that cuppola is a stunning Tiffany-style art glass dome that was destroyed in the 1906 earthquake, but quickly rebuilt (the building survived). The dome was painstakingly restored again in 1983 by Reflection Studios of Emeryville. Officer Christopher Putz of the SFPD said shuttered buildings are frequent targets for graffiti, and a tag on a historic building can represent huge problems for its owners, because it’s a difficult job to remove properly from certain older materials. “It’s just so expensive,” he said, adding that the offense for tagging historic buildings is almost always a felony, because of the high cost estimated to remove the graffiti. Dolmen Property Group looks like they did an excellent job of getting rid of the blight from their building. We wait with baited breath to see what else is in store. A housekeeping note: for those who might have tried to subscribe to the Timothy Pflueger Blog by email, the code I pasted in was not correct. Please try again to subscribe at the upper right hand corner of this blog, via email and you will get an alert the next time a new post appears. It should work now.